One of the Field Museum’s newest additions is a living, breathing, note-scribbling being who figures to bring a unique perspective on dinosaurs, mummies and the rest of the museum’s vast collections. Eric Elshtain, the Field’s first-ever poet-in-residence, represents the museum’s latest effort at using art to change the way visitors interact with nature. Years ago, the museum introduced its first artist-in-residence, Peggy Macnamara, whose watercolor paintings have helped guests visualize ancient forests and the deep sea. Since starting in his new role, Elshtain, 51, has been touring the Field’s research departments and begun working on several poems, including about the museum’s dioramas and its massive new guest, Máximo the Titanosaur. “While walking through the dioramas, I might ask myself, ‘Why are the animals in dioramas often posed as if they are looking at the viewer?’” Elshtain said in a recent blog post on the museum’s website. “‘I feel like I have startled them and that’s why they are frozen. They look surprised in my presence.’ Those are actual notes from my notebook. The difficult part is formalizing those thoughts and feelings into a poem. In addition to writing, Elshtain will host weekly poetry pop-up stations designed to change the way visitors view the museum. 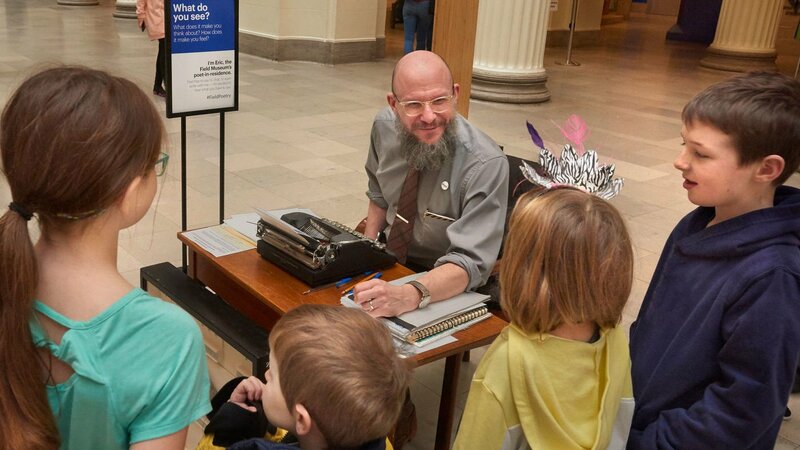 From 10 a.m. to 2 p.m. every Wednesday, Elshtain will set up with his desk and typewriter in one of the museum’s exhibition spaces. Guests of all ages and writing abilities can “chat with him about what they see and how it makes them feel,” and will also have a chance to write their own poems alongside Elshtain, according to the Field. Upcoming poetry pop-up themes include “What is an Animal?” (Feb. 27), “Rocks in the Head (March 6), “Ceramic Poetry” (March 13), “Restorative Poetry” (March 20) and “What Are We Made Of?” (March 27). Outside of his new role at the Field, Elshtain teaches poetry part-time through the nonprofit organization Snow City Arts, which places poets and artists into medical and clinical settings to help students keep up with their education through the arts while they seek treatment. He also serves as writer-in-residence at various hospitals in the Chicago area, where he hosts poetry workshops for patients of all ages, and provides workshops for teachers to help them incorporate poetry into their classes. Below, read one of Elshtain’s first poems from the Field, which was inspired by his experience holding a moon rock from the museum’s geology collections.